The purple & white orchid is Dendrobium Super Ise. The yellow & brown flowered orchid is Oncidium Mackenzie Mountain. Both are hybrids. Master Gardener Jimmy Grogan speaks the language of plants. Originally a teacher of English as a Second Language, he experienced a kind of epiphany one day riding in a rickshaw in Java where he worked. The beauty of the botanical world struck him suddenly and dramatically. For the first time he started a garden and in that tropical area he quickly had a very satisfactory jungle. A trip to the forests of Borneo brought a second revelation about the natural world—the fantastic and enormous tropical trees in all their impressive diversity. He was awed by the huge specimens in the dipterocarp family, a tropical tree family that seems to dwarf even redwoods and sequoias. “They are the giants of the tree world. One tree looked like a rocket ship with buttresses 20 feet up,” he recalled. “I didn’t want to be an English teacher any more. I wanted to work in tropical forests,” he decided. “There is something about looking at a tree. Plants engage. There is love. It is emotional. It’s relational,” he explained with passion. Returning to the States, he earned a master’s degree in forest ecology at Yale University and then spent two years in Thailand. “That was when I first experienced the diversity of the tropical forest. There were 400 species of trees and I had to know all of them,” he said. “To me botany is a language. When you collect the names of things, their identities, you begin to know who you are dealing with,” he added. For Jimmy, the Amazon in Brazil was “an incredible adventure, a wild, wild West scene. I was always on the frontier.” There was always a lot of violence associated with the lumber industry in South America including a “mahogany Mafia,” he said. Jimmy spent about 10 years in Brazil, mapping the patterns of mahogany clusters as a population ecologist. “Then my back went out after an injury and it required surgery. That was 13 years ago,” he said. “I washed up in Leverett. I have a brother and a sister in this area. I was essentially tied to a bed for four years,” he recalled. While he was recuperating, his sister asked him to do something about her dying houseplants. He happily obliged because “When I had my hands on plants, I didn’t have pain.” He became hooked on house plants, especially cacti and succulents, started buying his own plants and ended up with perhaps 300, many of them under lights. He was trying to figure out a new career since he couldn’t work in remote forests again due to his back. While visiting his parents in North Carolina he became friends with the director of the greenhouses at the University of North Carolina-Charlotte who suggested Jimmy consider greenhouse work, adding, “You need to know something about orchids.” Jimmy had been vaguely aware of orchids in the tropics where they mostly grow in the trees but he was too focused on the trees themselves to appreciate the diversity of the orchid family. 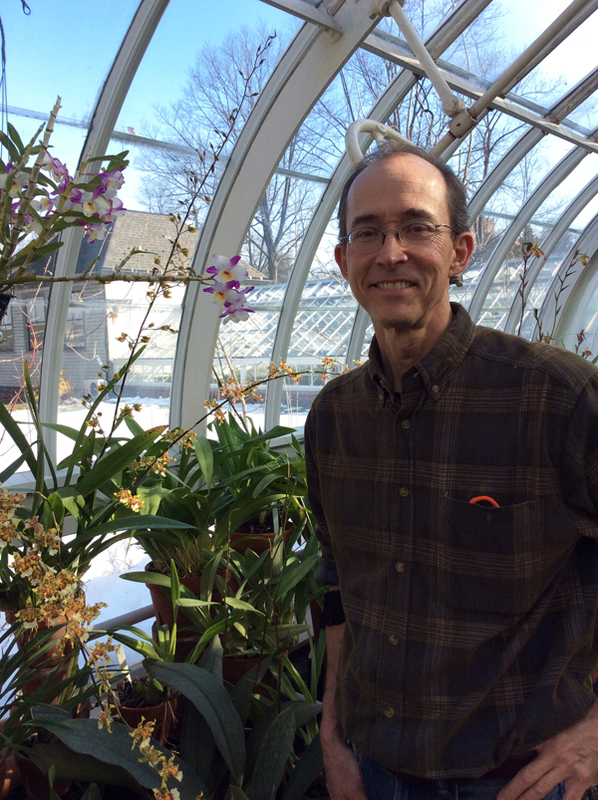 Back in Massachusetts he asked local orchid guru Bill Hutchinson if he would take him as an apprentice in his Amherst greenhouse, which he did for three years starting in 2008. He also visited the college greenhouses often. 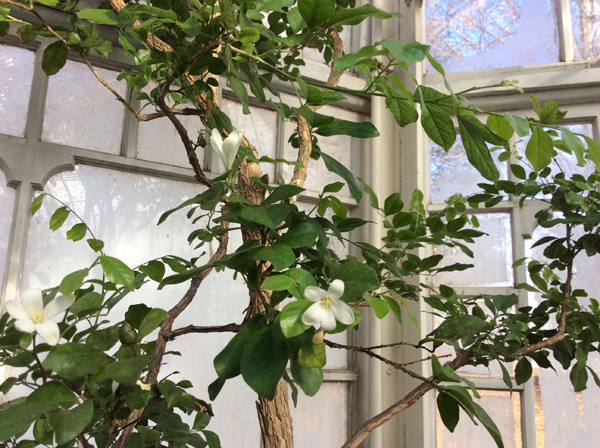 One day at the Talcott Greenhouse at Mount Holyoke College he noticed one of their prized orchids was badly placed for its growth habit. He mentioned the problem to employee Gail Fuller who later asked him to become a greenhouse volunteer taking care of the orchids. In 2012, he became a paid part-time employee and last fall was hired as full-time manager of the Talcott Greenhouse. Those photos are of Murraya paniculata, the understory shrub that I first met in the mountains of Thailand. 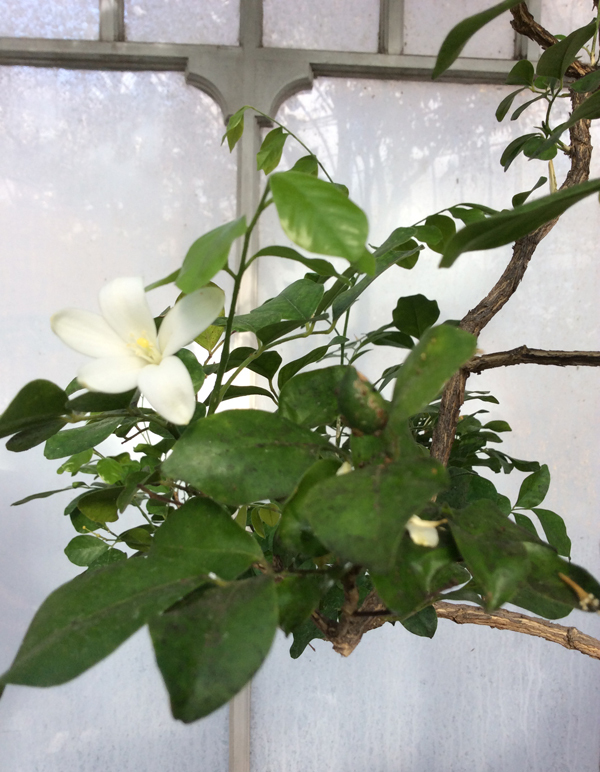 The white flower is very fragrant. Accepting the fact he couldn’t return to work in the tropics was traumatic but Jimmy has found a new career, which includes sharing his knowledge and his love of plants with the public. “Working with plants is the number one source of aesthetic pleasure in my life,” he said. 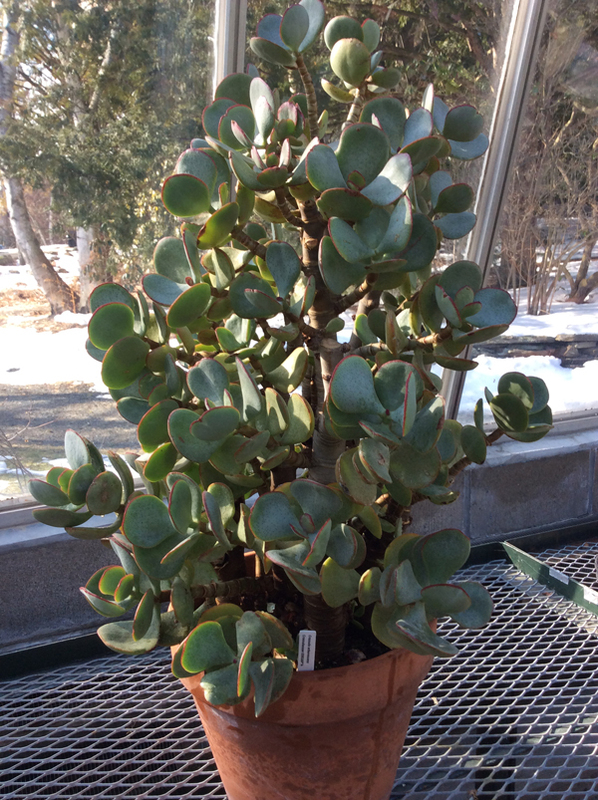 The other plant, as you surmise, is silver jade, Crassula arborescens.